10. 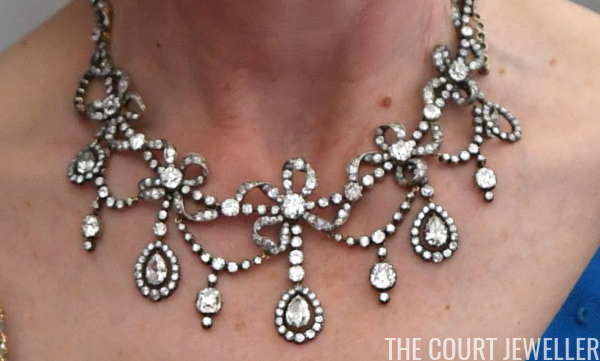 The Modern Ruby Set: This suite of jewels, which includes a necklace and coordinating earrings, may have been a Saudi gift; she wore the set at Claridge's during the Saudi Arabian state visit in 1987. 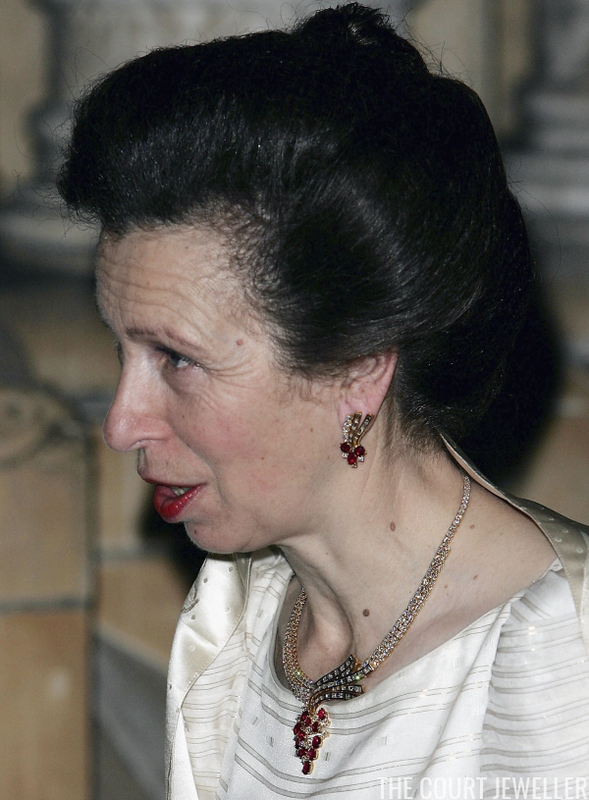 Above, she wears the jewels for the annual Festival of Trees Gala at the Natural History Museum in London in December 2004. 9. 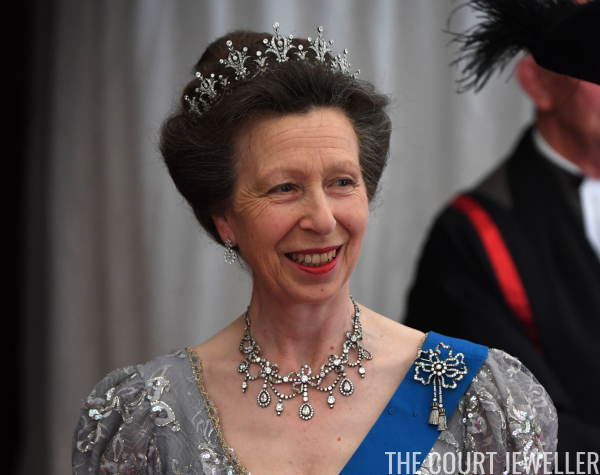 The Aquamarine Suite: Anne owns numerous pieces of jewelry set with aquamarines, including the unusual Aquamarine Pineflower Tiara, which was made by Cartier for the Queen Mother. (Read all about that piece, and see pictures, over here!) 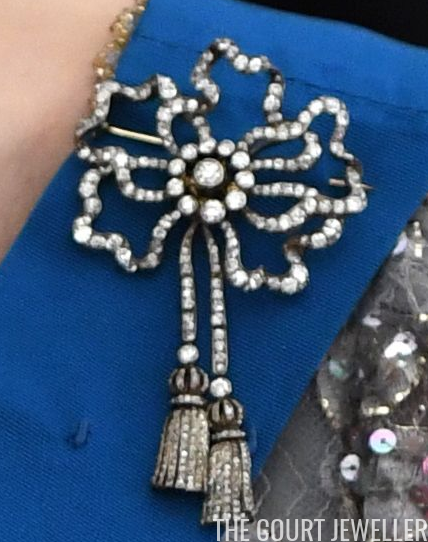 Here, in a photo from a Buckingham Palace garden party in 2014, Anne wears a diamond and aquamarine pendant on a single-stranded pearl necklace, pairing it with the brooch that used to be the central element of the Pineflower Tiara. 8. The Three-Stranded Pearl Necklace: Anne's collection includes many pearl necklaces and chokers, but one of the most impressive and classic is this creamy, balanced three-stranded necklace. 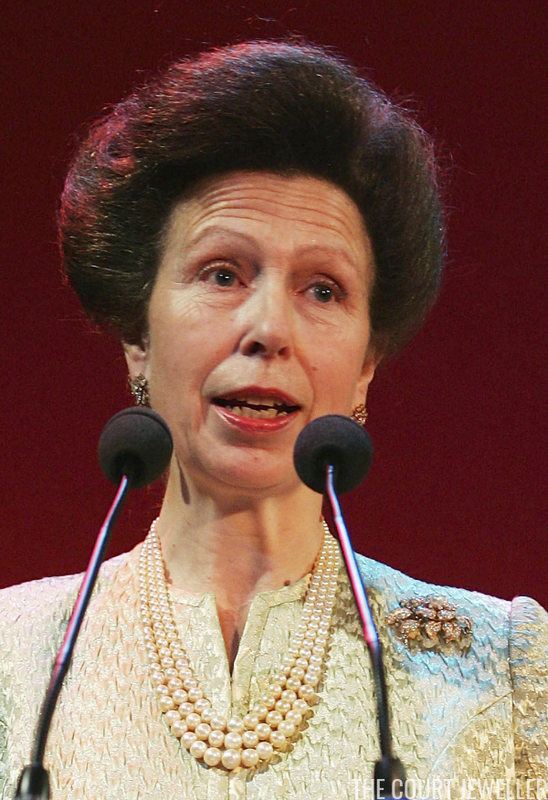 Above, Anne wears it to deliver remarks at the British Olympic Association's Gold Ball in October 2005. 7. 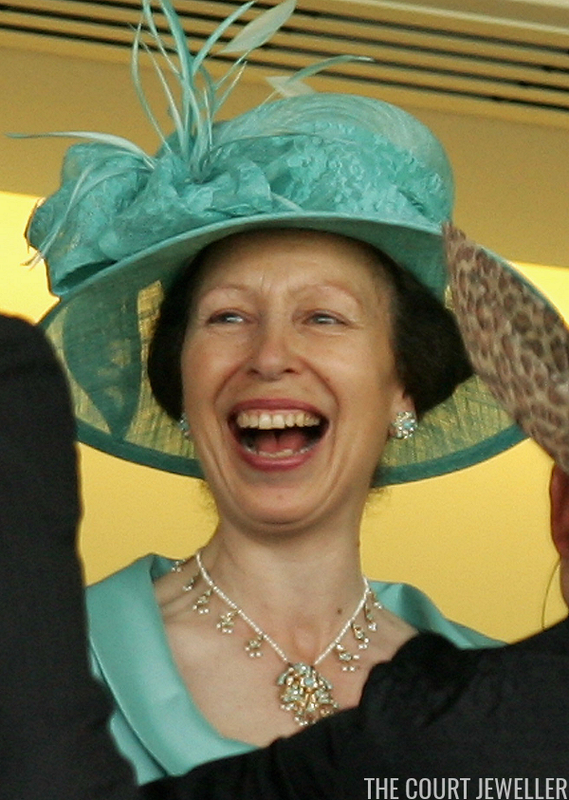 The Turquoise and Pearl Necklace: This unusual necklace of turquoises and seed pearls, worn above by Anne on Ladies' Day at Royal Ascot in June 2007, was given to her mother, Queen Elizabeth II, by the President of Pakistan in 1971. 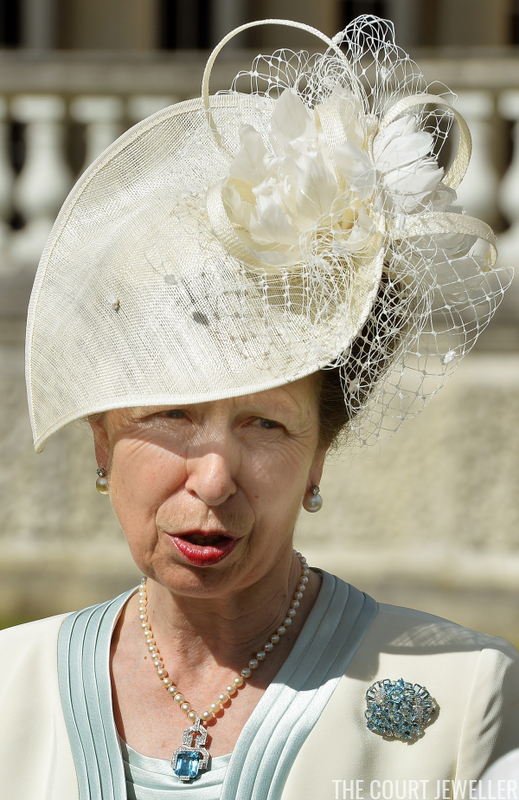 Anne has been wearing this piece in public since the 1970s. 5. 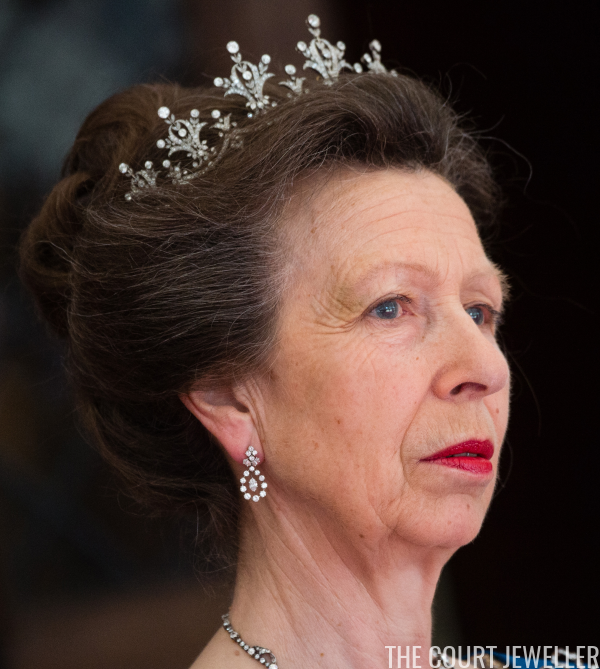 The Diamond Ribbon and Tassel Brooch: This diamond brooch, which Anne often pairs with her festoon necklace and tiara, was Anne's wedding gift from her elder brother, the Prince of Wales, in 1973. The piece features a stylized ribbon bow with two pendant tassels.